Were Christians Responsible for the Inquisition? Christians were not responsible for the Inquisition. Christians defeated the Inquisition. This has been the exact record of Christian history. Does anyone truly believe that the medieval Catholic Church was following the teachings of Jesus? In fact, we know they weren’t. They had abandoned the Scriptures and instead had created a doctrine that blended tradition and classical philosophy in with the Bible . . . and those who opposed this nonsense were persecuted mercilessly. 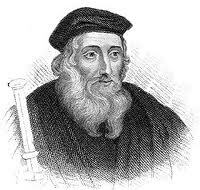 For example, John Wycliffe’s outcry against the popes and bishops of the Catholic Church began in the 1370’s. He knew the Word because he was a priest and a scholar at Oxford University who worked on translating the Bible into English. His anger over the wrong doctrine of the Church (especially concerning the Eucharist, the papal claim to Peter’s authority, Catholic prisons, and extra-biblical rules) would lead to the loss of his position and his condemnation by Pope Gregory XI. Although Wycliffe would escape the fires of the Inquisition because he was friends with the King’s son, John of Gaunt, his followers, known as the Lollards, wouldn’t. In 1428 he was posthumously declared a heretic and his bones were dug up and burnt. John Huss would follow in Wycliffe’s footsteps. He made a statement about the condition of the Catholic Church by hanging pictures of the Pope in all his rich clothing next to the image of the poverty-stricken Jesus. He also stressed the authority of the Scriptures and preached that neither popes nor cardinals had any right to teach anything that was contrary to the Word. He encouraged his congregation to disobey orders from the Church and rebuked them for worshipping images, taking superstitious pilgrimages, and buying indulgences. That one statement would lead to the demise of the entire religious power structure of the medieval church. Atheism had no power to conquer the poisonous religion of medieval Catholicism, only those who heroically believed the Gospel had that power to overcome. Previous Is Christianity the Enemy of Science?